Returning from work on my bike, I decided to squeeze between the front of my plug-spitting truck and the hedge. 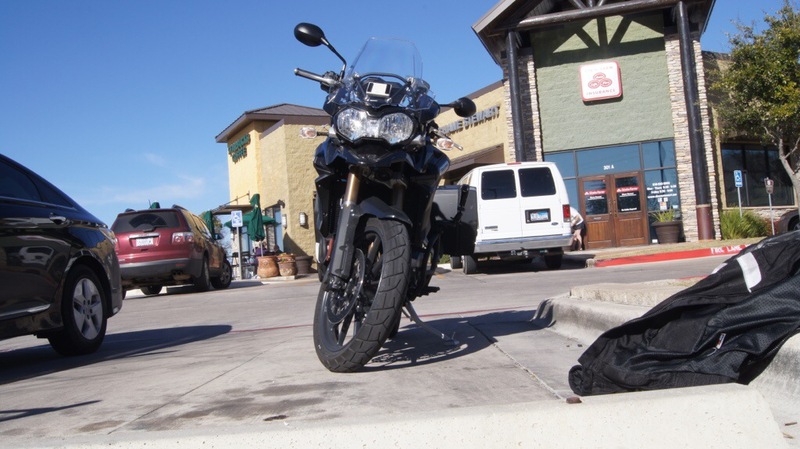 It occurred to me to just park up, move the truck, empty the two side panniers and top box. But no. So through I rode. Like the Six Hundred, short 599. The right pannier nudged the truck. You know that slo-mo thing? It’s going! No, I can hold it. Now what? No, I can’t hold it. Stood, straddling a big heavy (570 pounds, plus two laptops plus panniers plus shopping, so maybe 650 pounds) lopsided bike, I was holding my own. As in feeling a plonker. On the other hand, I have long had a notion to invent a one-man bike lift, so here was what liberals call “a learning experience”. Back to the prone bike. Actually, the bush did a great job, sort of. And the crash bars and sliders I fitted also worked a treat. I used a trolley jack (Bump jack in American) after lifting the bike by attaching a ratchet tie-down between the floor-side crash bar and the truck cow catcher, and another one to the topside crash bar and said cow catcher. Like a good socialist, I ratcheted the bike high enough, slid in the jack, and eventually manhandled the bike up and away. So. I want to invent a bike jack that can be used by one person, carried on a bike and easily stowed, attached, etc. This entry was posted in Motorbikes, Random and tagged dropped bike, Motorbikes, picking up heavy motorbikes. Bookmark the permalink.